Hospital Clowns in the last 40 years have grown in number and today are an integral part of many hospitals all over the US, UK and Europe. Doctors say that with the intervention of hospital clowns their patient’s and in particular children the chances of recovery are enhanced. They have noted that their response to treatment is more positive. Hospital Clowns are in great demand all over the world and India is waking up to this concept. They create happy moments that last a lifetime! What is important in hospital clowning, like so many things, is to make sure the clowns are well trained. It's not the nose but the person behind it that can change a child's environment into a place of play. Training needs to be in understanding children and hospitals but also deeply into clown character and improvisational skills. The Little Theatre's Hospital Clown troupe consists of 12 professional entertainers trained by Hilary Chaplain who is a world renowned Clown and a master trainer in hospital clowning from New York. She is a highly acclaimed Clown having performed to rave reviews all over the world. She is a much sought after master trainer in Clowning and in training Hospital Clowns. 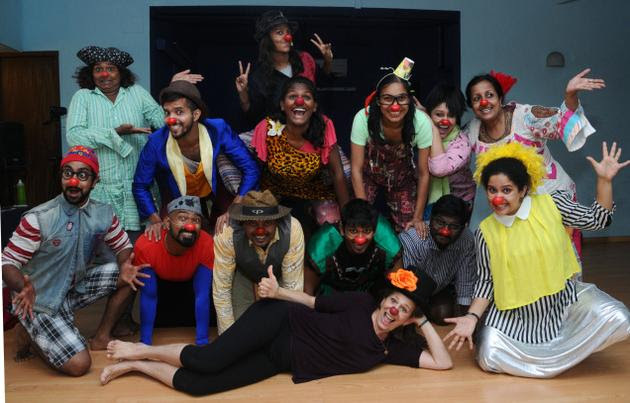 The Little Theatre's Hospital Clown Troupe is the first of its kind in India. And the Government Children's Hospital in Egmore has the distinction of being the first one to have such a unique programme in place on a regular basis. The little theatre's outreach programme at the Government Children’s Hospital in Egmore started on Monday June 8th 2015 with the support of The Coast Guard. 4 or 5 hospital clowns regularly visit the hospital on a Wednesday from 3 to 5 pm and work with the children and their parents in a few selected wards. This outreach happens once a week. The Little Theatre is delighted and thankful for the support by the Coast Guard for funding the first month of operations. Government Children's Hospital in Egmore. for this service on a remunerative basis. ​Email us at littletheatre@gmail.com for more details.